CaribPR Wire, Thurs. Sept. 25, 2014: In commemoration of Trinidad & Tobago’s 38th anniversary of a Republic and the country’s first investment conference in New York City, private Caribbean investment promotions arm, Invest Caribbean Now, hosted the country’s first female Prime Minister, Hon. 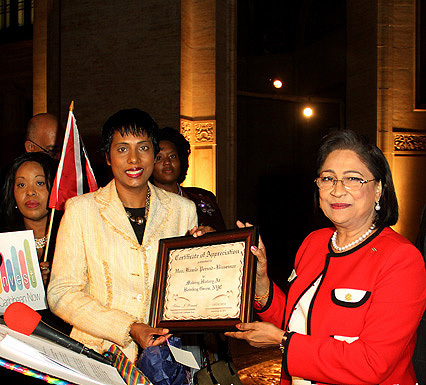 Kamla Persad-Bissessar, in a flag raising ceremony at Bowling Green, New York on Wednesday, September 24th. The event was held in conjunction with the Bowling Green Association and the New York City Department of Parks and Recreation at the Bowling Green Park at the southern tip of Broadway, a mecca for visitors from around the world and home to the world famous 3 1/2 ton bronze “Charging Bull.” The flag was raised at 1:45 p.m. on the towering 55 ft. flag pole by Prime Minister Persad-Bissessar and was followed by a private reception at Cipriani’s at 25 Broadway in Lower Manhattan. ICN Founder and Chairman, Felicia Persaud, presented the prime minister with a Certificate of Appreciation at the ceremony for “making history at Bowling Green” while ICN President, Sheila Newtown-Moses, said she looked forward to further collaboration and partnership between Invest Caribbean Now and the government of Trinidad and Tobago. The ceremony was attended by a number of Trinidadian and American nationals in New York, including Brooklyn Assemblyman Nick Perry as well as several Trinidad government officials including InvesTT President, Mrs. Racquel Moses; InvesTT vice president, investor sourcing, InvesTT and manager marketing & communications, InvesTT, Shurla Henry-Gibson. Trinidad and Tobago gained Independence from British colonial rule on 31st August 1962 and became a Republic twelve years later on September 24, 1976. Invest Caribbean Now (ICN): Invest Caribbean Now is the only privately owned New York-based investment agency promoting investment in the Caribbean and the brainchild of Caribbean American entrepreneur Felicia Persaud. Its annual investment summit presented by digital media solutions company Hard Beat Communications, brings together investment bankers, private equity investors, Chinese and U.S. government officials, Caribbean ministers of governments and premiers, hotel developers, architects, real estate developers, financial advisors, entrepreneurs and the media in New York City annually to focus on investment opportunities in the Caribbean and wealth creation for the region.